The BEFORE image shows dull grey tile and dark, dirty grout lines. 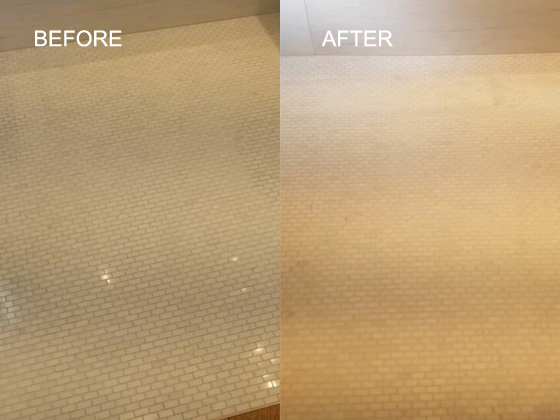 The AFTER image shows how we restored the cream marble color, replaced the grout, and changed the finish to a soft matte. Many of the tiles on this White Thassos floor had almost 1/4″ of lippage. In some areas, the grout was missing, overall, the grout was discolored, and some of the tiles were very rough and dirty. Upon inspection, we discovered that these unsightly tiles had been installed upside down. The client had a difficult time finding anyone to work on the floor, despite searching for more than a year. Every company she called recommended that she replace the marble, until one day, a tile store manager recommended Fabra-Cleen. We usually reserve our grout removal services for the most extreme cases, preferring to replace portions of grout and then color seal to achieve a nice, uniform result. However, the grout on this floor was too badly damaged. First, we completely removed the grout. Then we ground the floor flat and level, virtually erasing damage in the process. Then, we honed the floor to achieve the soft, honed finish the client requested. We applied sealer to the marble to inhibit staining and then regrouted the floor. The final result was beyond the client’s expectations. Are you looking for marble floor restoration services in the NYC | NJ | CT area? Contact us online or call us at 212-777-4040 | 718-776-3564 | 516-377-0993 to discuss your needs.